The Egyptian army has started arresting anti-government protesters in the center of Cairo. It marks a change of approach by the military, which previously was not intervening in clashes between supporters of President Mubarak and anti-government demonstrators. 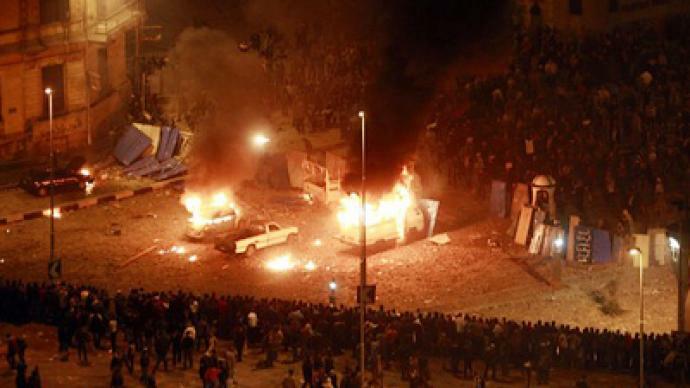 According to unconfirmed reports, as many as 300 people may have been killed in Egypt, over 3,000 injured and hundreds arrested. The country is braced for more trouble as it enters its tenth day of unrest. Pro-Mubarak and anti-Mubarak demonstrators take on one another in front of Cairo Museum. There have been Molotov cocktails thrown and people have been uprooting road signs to use the poles to fight one another. The violence shows no signs of abating. Ambulances are at the scene taking care of the injured. There are make-shift clinics operating there as well. There have been signs of people praying on Tahrir Square, the size of about one square mile. There was a moment on Wednesday, before the two antagonist groups attacked one another, when it seemed the confrontation could be diffused. Then, out of nowhere came people on horses and camels that started to whip the crowd. There are military checkpoints all around the perimeter of Tahrir Square, but not on the Square itself. Scared foreigners are frantically making their way from the city to the airport in cars, with passports in their hands, as countries urged their citizens to get out of Egypt. 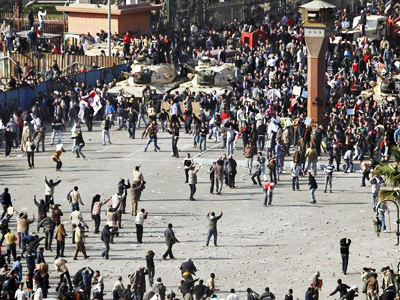 What is becoming clear is that this is President Hosni Mubarak’s mobilization. There is no doubt that his supporters on the streets get help from the government. There are fears that as the sun rises they will receive reinforcements and that the violence will only intensify as the day carries on. The question is who will come forward. 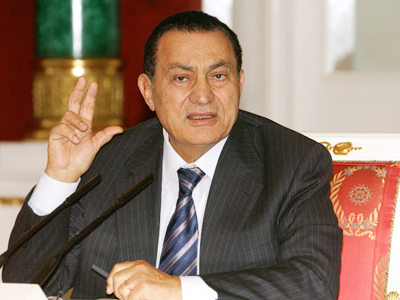 Evidently, Mubarak is not going to step down without a fight, despite the call of the protesters to quit immediately. Mohammad ElBaradei is the figure that has been supported and is being supported by the US. He is seen in Egypt as an American puppet and a person who will obediently follow the will of the international community rather than the will of Egyptians. Still, there is a hope that the military might intervene. They are close to the scene of violence and can actually do something to stop it. But the fact is they are standing there doing nothing instead of putting pressure on Mubarak to stop the stand-off. Their silence sends a worrying message about which side they are on. Russia's Foreign Minister Sergey Lavrov told RT that no foreign intervention is necessary to help resolve the crisis in Egypt. “I do not think that any outsiders should be pushing Egypt one way or another. I do not think any suggestions from outside are going to be helpful and are going to lead to a sustainable resolution of this situation. I do not think ‘official deadlines’ and ‘ultimatums’ are in order and I strongly believe that the Egyptian political forces, political groups must themselves find the way out,” Russian FM concluded. ­Adel Al-Adawy, member of Egypt’s Foreign Relations Council, believes there is a lot of foreign involvement behind the violence in Egypt. The events in Egypt and Tunisia are already changing the political life of the Middle East, and calming the situation in the region is up to the countries involved, not the powers from outside, said Al-Adawy. “You do not expect somebody from outside to help you. What can help the people is help from inside of the country,” Adel Al-Adawy pointed out, adding that Egypt does not need any help from anyone, but would appreciate support from everybody. ­Political observer Peter Emerson in Belfast, remarks that the West often calls out for democracy, but the term is seldom defined as such. Usually the countries which make such calls mean their own systems: a two-party system or at least a government versus opposition system, where the parliament is divided. 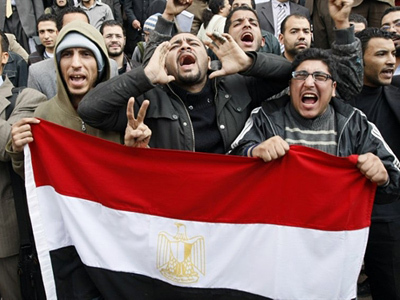 Systems of that kind will not help Egyptians retain the solidarity they have been showing in the streets, Emerson believes. “My worry is that if Egypt, or any of the other countries, takes on the majoritarian form of democracy which we have in the West, in most countries, this will allow for one faction or another to dominate. The much better course of action would be for something like a government of national unity, there have already been calls for that in Tunisia… A government of national unity will ensure, or will try to ensure at least, that no one faction can then dominate and insist on their point of view,” Emerson says. ­Ibrahim Kamel, a member of Egypt’s ruling National Democratic Party, points out that the people protesting in Tahrir Square do not necessarily represent the majority opinion. ­Joel Rubin, deputy director of the US National Security Network, believes that the role of extremists groups in Egypt’s unrest is overestimated. 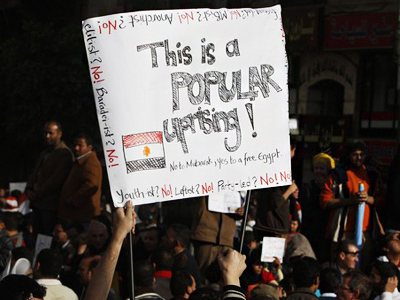 According to Rubin, the protests are primarily driven by working-class and middle-class Egyptians. Phyllis Bennis from the New Internationalism Project, an independent group that works to challenge US policies in the Middle East, believes that everything is changing in the Middle East and that the reign of the “US Empire” in the region since World War II is over.